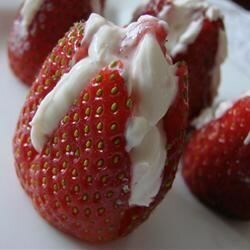 "Strawberries stuffed with lightly-sweetened cream cheese and walnuts are perfect for that romantic evening. They go great with champagne! Pecans also work well in this recipe." Yummy. I altered the recipe a little by adding a little more sugar, a little vanilla and topped it off with graham cracker crumbs. It's like a strawberry cheesecake inside out. We are not dessert people, for us, this was an excellent "non-dessert" for a special occasion. Definitely add the vanilla!